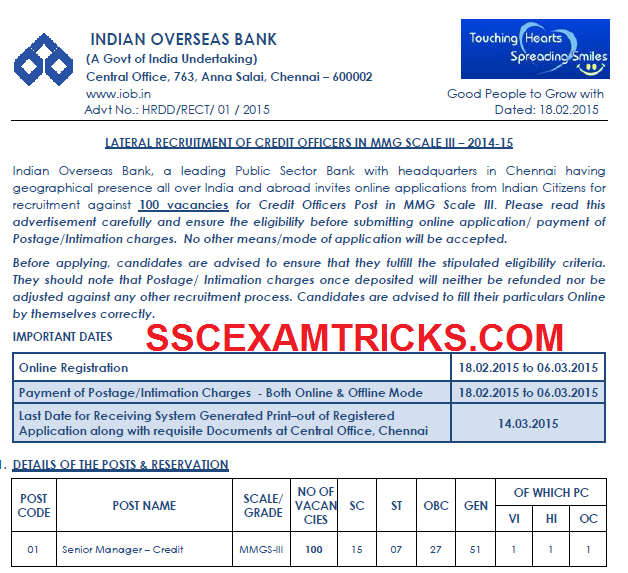 Indian Overseas Bank (IOB), a leading Public Sector Bank has released latest notification advertisement on 18th February 2015 for the posts of Senior Manager – Credit Scale Middle Management Grade Scale (MMGS) -IIII for Full Time MBA/Post Graduate Diploma in Management with Specialization in Finance having Minimum 4 years of post-qualification work experience as an Officer, handling Credit in Financial Institutions, of which at-least 2 years should be in a Scheduled Commercial Bank handling Credit Portfolio. The latest news is that the online application for these posts will be started on 18th February 2015 on the official website of IOB. Last date to apply online for these posts is 06th March 2015. The last date to submit hard copy/ print out of computer generated online application is 14th March 2015. The print is required to send by registered post/ speed post to IOB, Central Office, Chennai. Candidates must remind that only online mode of application will be accepted. No other means/modes of applications will be accepted. Before the registration, Candidates are requested to ensure that there is a valid email id in his/her name on any of the website like Gmail yahoo Rediffmail Hotmail etc. The final selection of the candidates will be based Personal Interview of eligible candidates only. Full Time MBA/Post Graduate Diploma in Management with Specialization in Finance CAIIB/Diploma in Banking and Finance by IIBF will be preferred. Minimum 4 years of post-qualification work experience as an Officer, handling Credit in Financial Institutions, of which at-least 2 years should be in a Scheduled Commercial Bank handling Credit Portfolio. Selection will be based on Personal Interview for the eligible candidates for these posts. The interview will be conducted by two stages i.e. document verification & personal interview.